As appeared in the Metter Advertiser, June 24, 2003. The Dixie Guards, Sons of Confederate Veterans of Metter Candler County recently co-hosted the Georgia Division Annual reunion in Statesboro along with Bulloch County's Ogeechee Rifles SCV camp. Over 400 delegates and their families attended the three day event which was cited by SCV State Commander Jack Bridwell as "one of the best state reunions". The annual event is touted as "a celebration of confederate heritage and kinship" among the state's 5000 members, said state adjutant Tom Brown of Eastanollee, Georgia. Brown added that this year's facilities and organization were "perhaps the best he has ever seen." The event kicked off on Friday, June 13th with family oriented festivities including an old fashioned barbeque held at the Statesboro Recreation Center's Honey Bowen building. The event featured country style beef, pork and chicken catered by The Rifles head saucier' Garland Nesmith and assisted by The Guards' own Wayne Lesesne. Live music and southern themed vendors highlighted the cookout. On Saturday, the delegates from various camps throughout the state conducted the annual business meeting. The delegates were convened at the Georgia Southern Russell Union auditorium in a closed session. Meanwhile in the lobby, over a dozen vendors and display booths showcased rare and unusual southern memorabilia for non-delegates and family members. Delegates attending for Metter's camp included Jeffrey Clifton, Jay Clifton, Ronnie Flynt, Grady Franklin, Ben Franklin, Jason Franklin, Wayne Lesesne, Jason West, Marcus Coursey, Tony Thompson and Randy Crooms. At the noon dinner Saturday, the Russell Union Ballroom was the scene for a catered dinner by Georgia Southern food services featuring keynote speaker, Professor Thomas DiLorenzo of Loyala College of Maryland. Over 250 people attended the dinner. Professor DiLorenzo is a senior fellow at the Ludwig Von Mises Institute and author of ten books including his controversial new book, "The Real Lincoln." Saturday evening the Russell Union Ballroom was the site of the annual awards supper Banquet and Debutante Ball, which featured a musical play by Stan Clardy of North Carolina. The meal was again catered by Georgia Southern food services. The Dixie Guards were recognized during the awards for outstanding merit during the year. Confederate of the year award was presented to Elijah Coleman of the Chattahoochee Guards Camp. Commander Randy Crooms of the Dixie Guards was cited twice for meritorious service. Following the awards and play, the debutantes were presented. 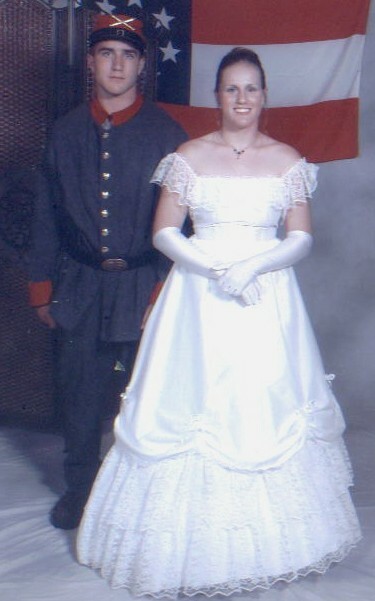 The Dixie Guards were represented by Jesse Clifton in a white chiffon dress, and presented by her brother Jeffrey Clifton in full confederate uniform. Jessica is a sophomore at Cumberland College and 2002 graduate of Metter High. Jeffrey is a sophomore at Metter High. On Sunday, the event concluded with a memorial service in front of the Bulloch County courthouse on the lawn. The sermon was presented by SCV- Chaplain-in-chief Pastor John Weaver and featured music by Stan Clardy, choral singing and a 21 gun military salute with artillery and muskets. The event was promoted by the Statesboro's Business and Convention Bureau, The Dixie Guards, The Ogeechee Rifles, The Georgia Division SCV, and many area businesses. Metter's Jesse Clifton (photo below) represented the Dixie Guards, Sons of Confederate Veterans Camp #1942 at the State Reunion Debutante Ball on June 14th at the Georgia Southern Russell Union Ballroom. She was presented by her brother Jeffrey Clifton. Their parents are Jay and Mary Clifton of Metter.